The Blaze Orange Maine Rolled Wool Crusher Hat is a Maine favorite during deer hunting season. 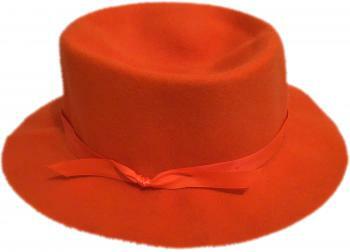 It is made from comfortable and flexible real wool felt in bright hunter safety orange. Once you try the Blaze Orange Crusher Hat you’ll finally be done with that raggedy old stocking cap you’ve been wearing. And when you come up to Maine to hunt, you fit right in with all the guys down at the general store bragging about their deer. Just roll the blaze orange wool felt hat up and keep it in the truck, in your pocket, or in your pack. Then just grab your crusher hat when you need it. Choose your size at checkout and try this blaze orange felt hat today!